Super Sani-Cloth Germicidal Disposable Surface Wipes with 55% alcohol are ideal for daily use in fast-paced environments that require the shortest contact times and broadest coverage of microorganisms. They are an intermediate level disinfectant as they are effective against Mycrobacteria (i.e. Tuberculosis). 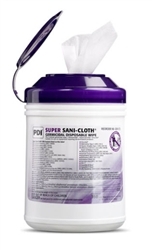 Super Sani-Cloth Surface Wipes provide fast contact time for quick room turnover. They are compatible with a broad range of surfaces and equipment in healthcare. They also meet CDC, OSHA and CMS Tag F441 guidelines. Extra Large Individual Packets | 11.5"x17.75"
Canisters feature a deep well lid that provides ample space to store and access the next wipe. Wipes are thick and strong and the material has a high fluid capacity. They are more pliable to get into crevices and difficult corners of equipment. Super Sani-Cloth Wipes are for use on hard surfaces only. They ARE NOT a skin wipe. For skin cleaning and care products please see either Skin Care Products or Skin Cleansers categories.